Patients and physicians continue to be motivated to find methods to reduce the use of allogeneic blood. Even though donor screening has increased the safety of donated blood products, autologous blood is the most desirable source of red cells during the perioperative period. The methods commonly used to obtain autologous blood during the perioperative period can be initiated prior to the operative procedure (autologous preoperative donation, acute normovolemic hemodilution) or during surgery (cell scavenging). Acute normovolemic hemodilution (ANH) involves a controlled removal of whole blood immediately prior to the operation. The patient’s intravascular volume is maintained with solutions that contain non-red cells. The operative procedure is conducted with a normal blood volume, but with a reduced red cell mass. At the conclusion of the operation, the stored autologous blood is restored to the patient. If operative blood loss is not excessive, the replacement of autologous blood may provide an acceptable red cell mass. 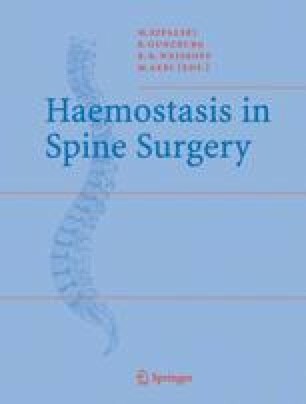 In addition to surgical blood loss, some of the key factors in determining how effective acute normovolemic hemodilution will be in limiting allogeneic transfusion are: the patient’s initial hematocrit and blood volume; the volume of autologous blood removed prior to the operation; the effectiveness of the hemodilution; and the timing of autologous blood replacement. In contrast to autologous pre-donation, autologous blood removed during acute normovolemic hemodilution is usually stored and re-infused in the operating room.